I believe this had crossed our minds at some point since Team Fun was established back in August 2013, and finally we have decided to do something about it. We would like to honor Michell Thitathan aka Theoperasmorg as Team Fun member of the quarter. 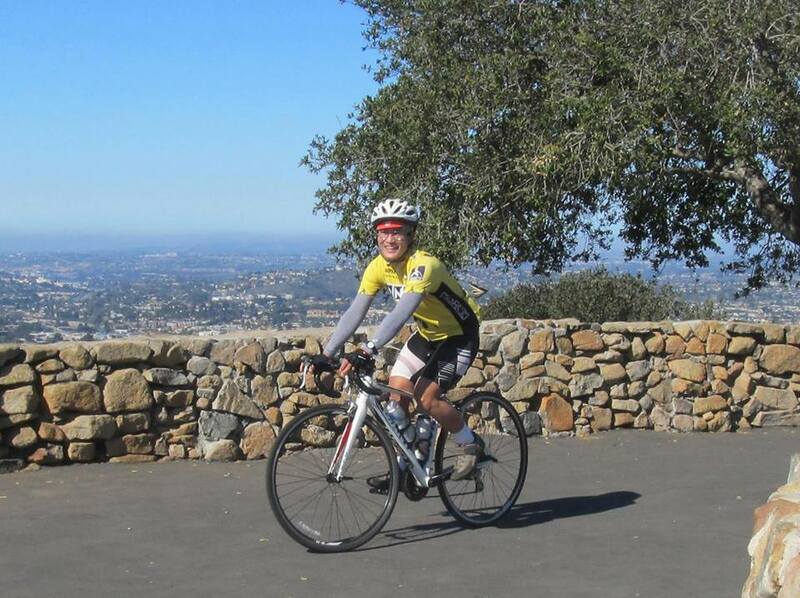 She is the most dedicated cyclist I know, and has been a devoted and inspiring ride leader for TF since our fifth ride back in September 2013! 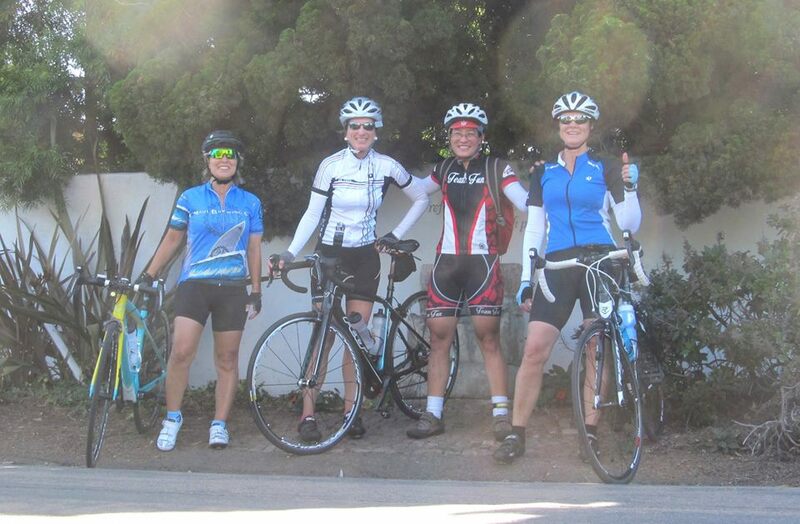 While the rest of us stay in bed until an hour or so before our Saturday rides, Michell rides her bike from her home in San Diego, in the dark, to join us as a Team Fun ride leader. 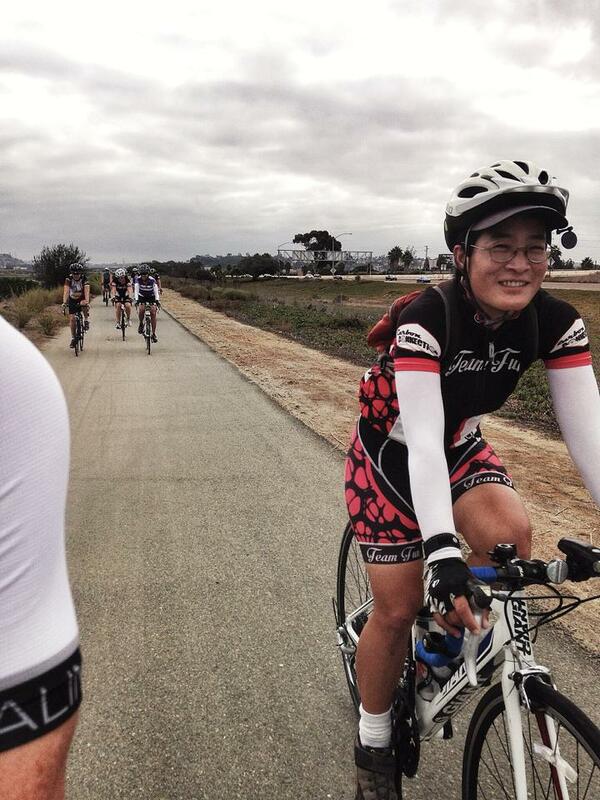 As a knowledgeable cyclist, she has helped out countless new TF members who not only are new to TF, but new to cycling. She is the ideal of what a ride leader should be, humble, patient, helpful, prepared, owns a great sense of direction (very important when riding new routes), encouraging, fun-loving, safe on the roads, and takes great photos and videos on top of that! Michell is one of everyone’s favorite TF leaders. I think some of the reasons for that are because she is always so helpful, positive and cheerful. I doubt that anyone has ever heard a harsh word leave her mouth. If there is a flat tire she’s there to help change it, and she doesn’t make you feel dumb if you don’t know how to do something. Michell is so fun to ride with. She is patient and funny and always knows the route. I love her commitment to TF and she shows it by riding to every ride and then leading the ride. She epitomizes what we want for TF. She is a good leader who teaches others things like changing a tire and what to do on the road in certain situations. She’s a great teacher. If she had lived in another era, Michell would be a perfect “Lewis & Clark” expedition member. She’s the whole package: fearless, adventurous, knowledgeable, strong & geographically savvy. 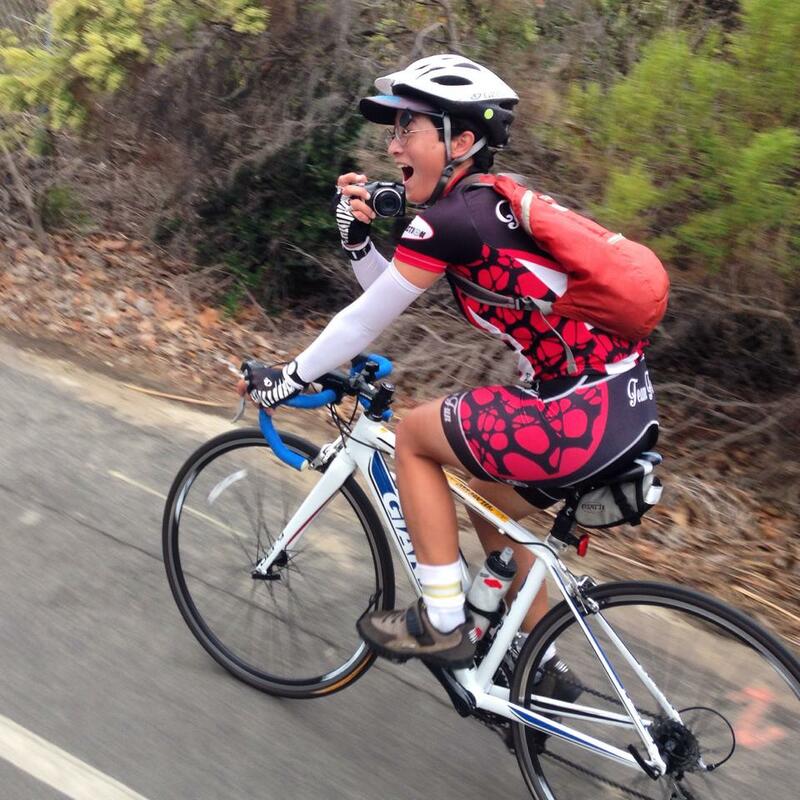 Her willingness to lead & share her cycling knowledge with others is greatly appreciated! We love you Smorg! Briefly, what got you into cycling? Transportation. :o) I got rid of the car in 2006 while living in close-to-everything-except-for-free-parking Gaslamp Quarter. Then in early 2012 I moved to Uptown area where ‘close’ became a bit more relative, especially when you’re on foot, so I bought an old Giant Yukon mountain bike to get around on. It worked quite well even though I found the hills around town pretty gnarly on lungs, heart and legs. I didn’t even make it up Park Blvd from Downtown without stopping… and that’s hardly a hill at all! On top of a hill, where else? Not anymore, but I did own three good ones when I was younger and more sensible. The original ‘Smorgmobile’ was a 1984 Dodge Caravan that I bought used after graduating from Professional Golfers Career College in 1993. I got rid of the last row of seats and put in a beach chair, a big cooler with stereo on top and the whole thing stayed in place, squeezed by luggage and a mountain bike… and a big set of golf clubs! I drove that picnic van 30,000 miles a year all over the continental USA until I traded it in for a Corolla sedan when I returned to proper college. Then I moved to Downtown San Diego just a couple of months after Petco Park opened in 2003 and found it ridiculous that it cost $200/month just to park that thing while I could walk everywhere. Sold the Corolla in 2006 and haven’t driven since. Rumor has it you were a golf pro, can you tell us a little about that? I was a touring pro for a few years from 1994-98 indeed, though I really wasn’t a good one. :o) It’s hard to imagine since there are teenagers playing on the LPGA Tour these days, but back in 1992 when I moved to Southern California from Thailand they actually didn’t allow anyone younger than 18 on the professional circuits. I was 16, so I ended up enrolling at Professional Golfers Career College (back then it was at Murrieta Hot Springs Resort, but have since moved to Temecula) for two years until I got old enough. I played on various golf tours in ’94 and ’95, scored a few top 3’s and 10’s but never won anything. Then I got too cute for my own good trying to cut a fade out of the rough at the Florida Q-School in ’96. My left wrist thought that was one trick too many and gave out. I tried to play for another year… mostly left-handed, which was a bit too interesting. My playing partners found me very confusing and thought they should get to decide if I hit the next shot left or right-handed. :oP After a while I got very confused, too, and decided to quit golf and go back to college before everyone started walking around in circles… This was before zombies became mainstream, you see, so that wouldn’t have gone down very well. You are also known for your love of opera. Tell us about that. Hohoho, that is a very operatic story! :oD I actually hated opera… I’ve always loved instrumental classical music, though, and got into quite a snobbish mindset about the vocal classical music. It didn’t help that the first opera I got to attend was Richard Strauss’ Salome. If you are into instrumental classical music, you’ll find Richard Strauss an extremely descriptive composer who really could describe in music a half-full glass of pilsner. I wish a glass of pilsner is what Strauss sonically describes in Salome… Alas, he went for a shot of a nearly naked young girl acting out her lust on a scruffy guy’s severed head and staining herself with big drops of blood instead. That was a bit much for 16 yrs old me, so I laid off going to another opera for a long long time. How did you get involved in Team Fun? I got a notifier from meetup.com that there’s a new cycling group in town and joined the group, thinking that I might come up to a ride or two if the route looks interesting. Team Fun always started at Agility Studio in Carlsbad then, and I wasn’t keen on the 76 mile round-trip commute (public transportation doesn’t run early enough on weekends, so I’d have to cycle up to the ride). Bea Mills was still with the group, though, and she is a one-of-a-kind headhunter who kept sending messages asking me to come out for a ride. After a while I decided that the only way to get her off my back was to bite the bullet and turn up once. Bea knew what she was selling, though, and Team Fun has proven extremely addictive and tolerant of all my shenanigans! I kept wondering when I was going to get thrown out. Instead, Bea just went and added me to the team one day. I was pretty convinced that she had me confused with another more responsible rider! 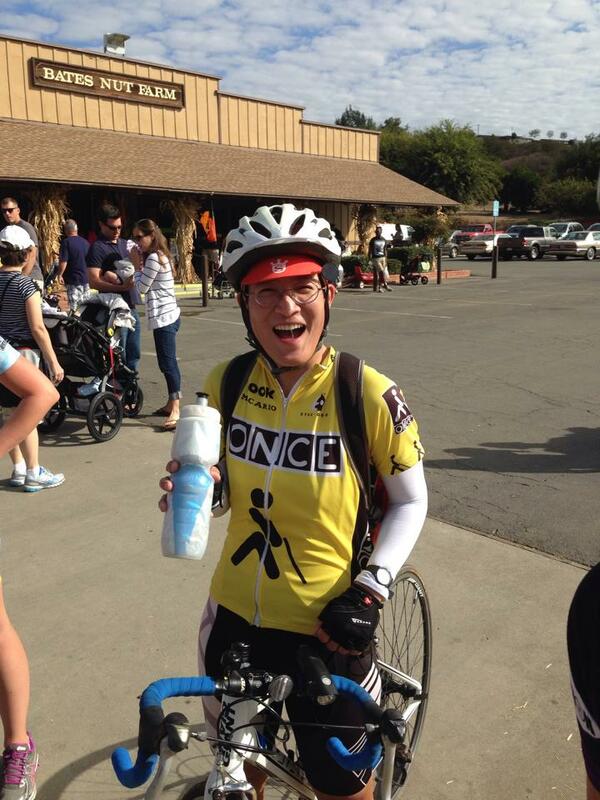 :oD I’ve been trying to impersonate ride-leader material ever since, to varying degrees of success. Thanks so much for putting up with me!